Students at Roosevelt School #7 in Garfield, N.J. and the New Jersey Community Development Corporation (NJCDC) in Paterson, N.J. received a special visit from Spencer Savings Bank employees on Read Across America Day, March 2, 2017. 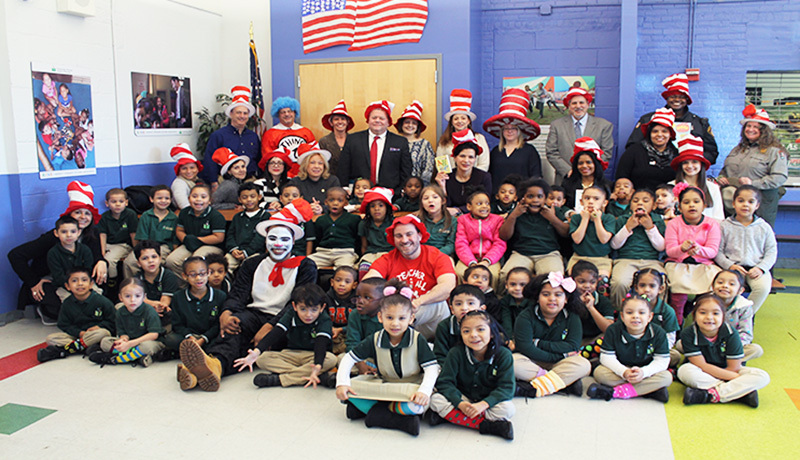 In Garfield, Spencer volunteers wearing Dr. Seuss hats read to 50 students in the kindergarten and third grade classes. Volunteers also visited the NJCDC for reading sessions with 60 students in the second and third grade classes. Organized by the National Education Association (NEA) and celebrated annually on Dr. Seuss’ birthday, Read Across America Day is the largest nationwide reading event in the United States. Thousands of schools, libraries, community centers, and organizations across the country participate in reading lessons and activities to promote children’s literacy on this special day. Children’s education and literacy are one of several initiatives Spencer Savings Bank champions on an ongoing basis. To keep up on Spencer’s latest volunteer work and community service, visit www.spencersavings.com.